Thermal imaging has been around a long time. Historically dominated by one manufacturer, thermal cameras have proliferated over the last decade and are now available from several popular manufacturers. While the costs of these cameras are still high, they have come down substantially and today you can even find thermal cameras for only a few hundred dollars. Popular in military applications, thermal cameras also have many practical applications for your standard integrator. In order to find the right applications for thermal cameras, it is important to first understand how they work. Thermal cameras capture infrared radiation given off by all objects. We perceive infrared radiation as heat, but heat is also a high frequency infrared that the human eye cannot see. 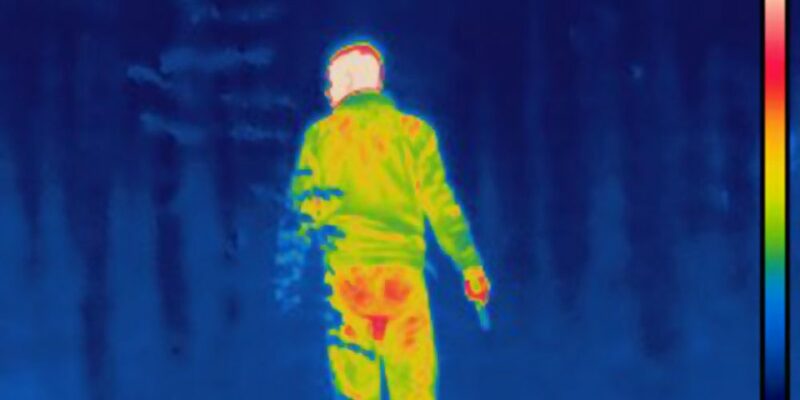 Thermal cameras use special sensors to capture the infrared radiation which is then processed and converted into an image. These images are typically at much lower resolution than high definition visual cameras. In fact, a high-resolution thermal camera is considered a camera with a resolution of 640×480, or only a third the resolution of a 1080p camera. There are limitations with thermal cameras due to the fact they can only see infrared radiation. Thermal cameras cannot produce colour images. While they can present the data in different formats, including a coloured image where red represents hot areas and blue cold, thermal cameras cannot capture the actual colour of an object. As a result of their lower resolution, they also struggle to capture fine details like the human face and in turn are not ideal when used to produce evidence in court. Despite these limitations, thermal cameras have two major strengths that drive their value. First, they are immune to darkness and can operate without any visual light. Due to their ability to operate without light, they are capable of seeing extreme distances. This combination makes them perfect for large properties or rural areas where lighting is scarce. Their second strength is the ability to measure temperatures in specific areas of the scene, something no other camera can do. Video analytics and other AI technology is also extremely effective when used on thermal images. Two of the biggest challenges for video analytics to work well is poor contrast and changing lighting conditions, both of which thermal cameras excel in overcoming. Due to the high contrast of warm objects like people and vehicles against cooler backgrounds like plants and buildings, video analytics on thermal cameras can easily distinguish between these objects. Furthermore, thermal images look the same any time of day, so the analytics can easily train on a consistent image that never changes. Another lesser known use for thermal cameras is real-time temperature monitoring. Certain thermal camera models have the ability to measure the temperature of objects in a scene. If the temperature rises too high, an alarm is triggered. This technology is commonly used to monitor machines and substation transformers that can cause significant damage if allowed to overheat. Thermal cameras may be a niche product and due to their inherent limitations will never entirely replace traditional surveillance cameras. However, as costs continue to come down and availability improves, expect to see thermal cameras becoming a lot more common. Their unique ability to see in the dark and measure temperatures means that when used in the right applications, they are capable of doing things no other camera ever could. Colin Bodbyl is the chief technology officer of Stealth Monitoring (www.stealthmonitoring.com).